Background: Polycystic ovary syndrome (PCOS) is a polygenic endocrine disorder in women of reproductive age that lead to infertility. The aim of this study was to investigate the effects of probiotic on pancreatic b-cell function and C-reactive protein (CRP) in PCOS patients. Methods: This randomized double-blind placebo-controlled clinical trial was conducted among 72 women aged 15-40 years old diagnosed with PCOS. Participants were randomly assigned to two groups receiving: (1) Probiotic supplements (n = 36), (2) placebo (n = 36) for 8-week. Fasting blood samples were taken at baseline and after 8-week of intervention. Results: Probiotic supplementation, compare with placebo, reduced fasting blood sugar (−4.15 ± 2.87 vs. 2.57 ± 5.66 mg/dL, respectively P = 0.7), serum insulin levels in crude model (−0.49 ± 0.67 vs. 0.34 ± 0.82 mIU/mL, respectively, P = 0.09), homeostasis model of assessment-insulin resistance score (−0.25 ± 0.18 vs. −0.05 ± 0.18, respectively, P = 0.14) nonsignificantly. Serum insulin levels after adjustment with covariates reduced significantly in probiotic group (P = 0.02). We did not found any significant differences in mean changes of CRP between groups (−0.25 ± 0.18 vs. −0.05 ± 0.18, respectively, P = 0.14). Conclusions: A 8-week multispecies probiotics supplementation had nonsignificantly beneficial effect on pancreatic b-cell function and CRP in PCOS patients. After adjustment for some covariates, serum insulin changes were significantly different between groups. Lifestyle modification, weight loss, and exercise would be beneficial in the management of PCOS. According to previous findings, it seems that lifestyle change and diet manipulation improve most chronic diseases. , Probiotics as living microorganisms  synergism with gut microbiota and probably influence on metabolic and inflammatory conditions. Dairy products including yoghurts, fermented foods and some cheeses are known as a valuable resources of probiotic cultures in diet. However, the gut microbiome alteration and biological effects of each source are ambiguous. Available probiotic supplements are influenced by initial dose strain, quality, temperature and anaerobic storage conditions. Previous investigations have indicated the beneficial role of probiotics in various diseases as gastrointestinal diseases, infections, diabetes and atopic diseases. Several animal studies reported that probiotics improved blood sugar and insulin resistance in diabetic rats. , A meta-analysis study showed that probiotic ameliorated insulin resistance in nonalcoholic fatty liver disease patients. Despite many evidences about the association between insulin resistance and probiotics in various diseases, a little information is available about probiotic and CRP. Considering the effects of probiotic supplementation on some metabolic disorders including insulin resistance and inflammation and these disorders are associated with PCOS, it seems that probiotic supplementation has favorable effects on PCOS. To the best of our knowledge and belief, this study is the first that investigated the effect of probiotic supplementation on pancreatic β-cell function and CRP in women with PCOS. Seventy-two PCOS patients aged 15-40 years old were assigned to this randomized double-blind placebo-controlled clinical trial that was performed in Isfahan, Iran, during May 2013 to December 2013. Exclusion criteria were age below 15 and more than 40 years, those with history of chronic heart, kidney, liver, lung or pancreatic disease specially cardiovascular diseases, thyroid disorder, small bowel syndrome, autoimmune disease, allergy to probiotic capsules or placebo, current or previous (within the last 6 months) use of chemotherapy, corticosteroid (insulin injection, statins, diuretics), antibiotic, multivitamin mineral supplements and omega-3 medications and women with specific diet or physical activity programs. Participants were stratified according to body mass index (BMI) (<18.5, 18.5-24.9, 25-29.9, >30 kg/m 2 ) and age (15-20, 21-25, 26-30, 31-35, 36-40 years) in order to matching participants and after getting informed consent were randomly allocated to one of the two groups: (1) Probiotic supplement (n = 32), (2) placebo (n = 33) for 8-week. Diagnosis of PCOS was done according to the 2003 Rotterdam criteria:  those with two of the following features were considered as PCOS: Oligo-ovulation and/or anovulation, clinical and biochemical hyper- and rogenism, and polycystic ovaries in ultrasonography. Subjects that admitted to the infertility centers of two hospitals affiliated to Isfahan University of Medical Sciences, Isfahan, Iran, as Beheshti and the Alzahra Hospital were screened for PCOS. Those who have inclusion criteria were entered to the study. Their blood samples were transferred on dry ice to laboratory of Sedigheh Tahereh Metabolism and Endocrinology Research Center, Isfahan, Iran for analysis. Patients in probiotic group received one Familact probiotic capsule (500 mg) daily that each capsule contained the following bacterial strains: Lactobacillus casei 7 × 10 9 CFU/g, Lactobacillus acidophilus 2 × 10 9 CFU/g, Lactobacillus rhamnosus 1.5 × 10 9 CFU/g, Lactobacillus bulgaricus 2 × 10 8 CFU/g, Bifidobacterium breve 2 × 10 10 CFU/g, Bifidobacterium longum 7 × 10 9 CFU/g, Streptococcus thermophiles 1.5 × 10 9 CFU/g. Participants in the placebo group received the placebo that contained starch and maltodextrins but no bacteria. The placebo was indistinguishable in color, shape, size, and packaging, smell and taste from the probiotic supplement. All capsules were provided by fermented biological company of Tehran University of Medical Sciences that was recorded and approved by Food and Drug Administration. The study was approved by the Ethical Committee of Isfahan University of Medical Sciences, Isfahan, Iran. Patients take capsules with water after lunch. Demographic characteristics of participants were collected by questionnaire. Three days food records were taken (2-week days and 1-week end) and Nutritionist IV software (First Databank, San Bruno, CA, USA) modified for Iranian foods was used to obtain nutrient intake. Three physical activity records were taken at 2, 4, and 6 weeks. Compliance to supplements was monitored by: (1) Participant interview (2) follow-up by frequent short message service and phone call (3) bring the medication containers. The registration ID in the Iranian website (www.irct.ir) was: IRCT2013081111763N11. Body weight was assessed with minimal clothing and without shoes by standard scale (Seca, Germany) to the nearest 0.1 kg. Height was measured by a wall mounted stadiometer to the nearest 0.5 cm. BMI was computed as the weight in kilogram divided by the height in meters squared. Waist circumference (WC) was measured in the middle of the lowest gear and the top of the iliac crest with a nonstretched tape. The blood samples (10 cc) were taken at the baseline and after 8-week intervention after 12 h of fasting. Blood samples were analyzed at Laboratory of Metabolism and Endocrinology Research Center, Isfahan, Iran. Blood was immediately centrifuged (Hettich D-78532, Tuttlingen, Germany) at 3500 rpm for 10 min to separate serum and stored at −70°C before analysis. Commercial kits were used to determine fasting plasma glucose (FPG) and CRP, (Pars Azmun, Tehran, Iran). The inter-assay coefficients of variations (CVs) for serum CRP were 4.00%. The intra- and inter-assay CVs for FPG were 1.74 and 1.19%, respectively. Serum insulin was assayed by immunoassay system (Advia Centaur Up, USA). The homeostatic model of assessment for insulin resistance (HOMA-IR) and the quantitative insulin sensitivity check index (QUICKI) was calculated with formulas: HOMA-IR = fasting insulin (μU/mL) × fasting glucose (mg/dL)/405, QUICKI = 1/(log (fasting insulin μU/mL) + log (fasting glucose mg/dL). Systematic error and inter-assay variability decreased by blinded fashion, duplicate, pairs (during intervention) at the same time, the same analytical run, and random order for glucose, insulin and CRP measurements. T -test was used to detect differences in general characteristics and dietary intakes between the two groups. The effects of probiotic supplementation on fetal bovine serum (FBS), Insulin, HOMA, QUICKI, CRP, and variations were compared by paired t-test. The percentage of changes in variables after intervention determined by of the following formula: ([after values - before values]/before values) ×100. MANCOVA was applied to identify any differences between the two groups at the end of the study that analysis was adjusted with baseline values and some covariates including age, BMI, waist, marriage status, education and physical activity to omit the probably potential bias. All statistical analyses were done by the Statistical Package for Social Science software (SPSS Inc., Chicago, IL, USA version 16.0). All results were expressed as means ± standard error. P < 0.05 was considered as statistically significant. Smirnov-Kolmogorov test was used to check the normality of our data. A total of 85 women were screened for PCOS in the infertility center of Beheshti and Alzahra Hospital Affiliated to Isfahan University of Medical Sciences, Isfahan, Iran. Totally, 72 patients had all the inclusion criteria and were ultimately included in the trial. Finally, 65 subjects (probiotic [n = 32], placebo [n = 33]) completed our study. Among individuals in the placebo group, three women (unwilling to continue [n = 2], become pregnant [n = 1]) and in the probiotic group, four women (unwilling to continue [n = 2], become pregnant [n = 1], health problems [n = 1]) did not complete the study [Figure 1]. 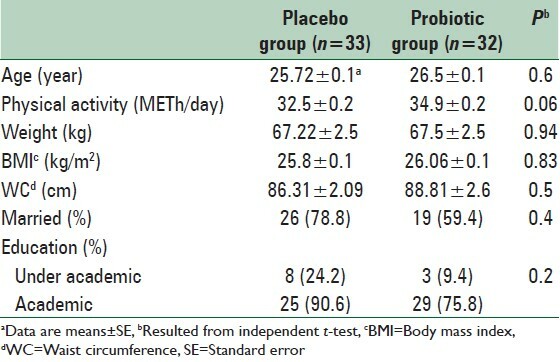 There were no significant differences in terms of mean age, weight, BMI, WC, marriage status and physical activity between probiotic and placebo groups at the baseline of the study [Table 1]. 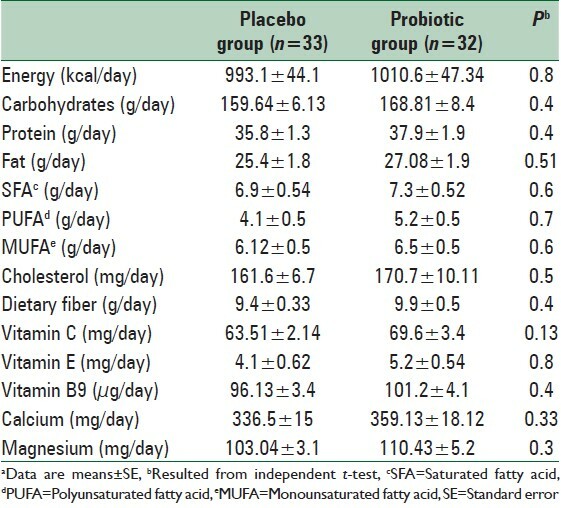 No statistically significant differences were seen between the two groups in terms of dietary intakes of energy, carbohydrates, proteins, fats, saturated fatty acids, polyunsaturated fatty acid, monounsaturated fatty acid, cholesterol, dietary fiber, Vitamin E, Vitamin C, calcium and magnesium based on dietary records that obtained throughout the intervention [Table 2]. We found within probiotic group a nonsignificant reduction in FBS (85.7 ± 2.6 vs. 81.5 ± 2.1 mg/dL, respectively, P = 0.2), serum insulin levels (9.8 ± 0.9 vs. 9.3 ± 0.71 μIU/mL, P = 0.5) and HOMA-IR score (2.11 ± 0.21 vs. 1.9 ± 0.2, respectively, P = 0.2) in before intervention compared with after intervention. Fasting blood sugar (−4.15 ± 2.87 vs. 2.57 ± 5.66 mg/dL, respectively P = 0.7), serum insulin levels (−0.49 ± 0.67 vs. 0.34 ± 0.82 μIU/mL, respectively, P = 0.09) and HOMA-IR score (−0.25 ± 0.18 vs. −0.05 ± 0.18, respectively, P = 0.14) reduced nonsignificantly in probiotic group compared with placebo. Supplementation with probiotic or placebo had no significant effects on pancreatic β-cell function and CRP (0.29 ± 0.12 vs. −0.05 ± 0.13 mg/dL, respectively P = 0.08). We found a significant difference in mean change of serum insulin (P = 0.02) after adjustment with some covariate including age, BMI, waist, education, marriage status, physical activity. Adjustment with the above-mentioned covariates did not affect our findings about other variables. When we adjusted the analysis for baseline values findings remained nonsignificant [Table 3]. The current study demonstrated that taking probiotic supplements for 8-week had no significant effect on CRP and pancreatic β-cell function among PCOS women. 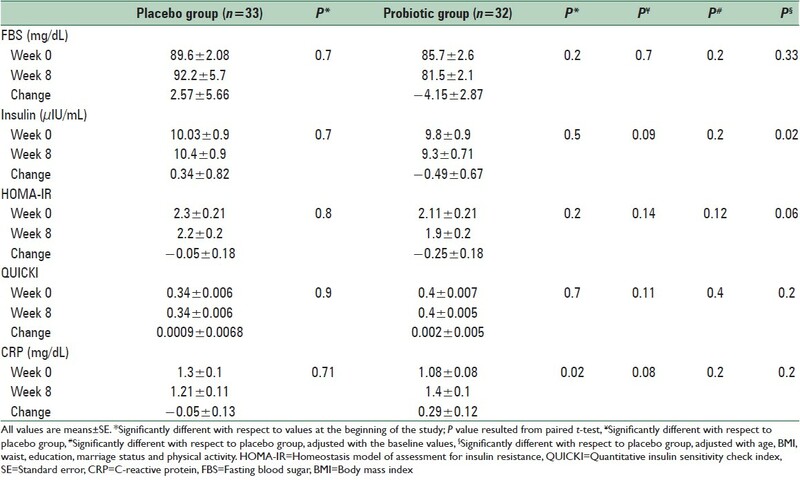 However, after adjustment with some covariates, only serum insulin level decreased significantly in the probiotic group compare with placebo group. Previous studies have assessed the effect of probiotic supplementation on insulin resistance and inflammation marker. To the best of our knowledge, the present study is the first study that investigated the effect of probiotic supplementation on pancreatic β-cell function and CRP in PCOS women. This study was the first study that assessed the effect of probiotic supplementation on CRP and pancreatic β-cell function among PCOS women. Some limitations of our study included: We were not able to assay the effect of probiotic supplementation on oral glucose tolerance tests and hormonal tests in subjects. In addition, long-term intervention might verify the results in terms of probiotic beneficial effects on inflammatory or insulin resistance markers. Probiotic dosage that was used in the present study was not assured by any guidelines. Treatment noncompliance is the risk of all randomized controlled trials. Probiotic supplementation for 8-week had no beneficial effects on FBS, HOMA-IR, QUICKI and CRP significantly. After adjustment with some covariates, serum insulin changes were significantly different between groups. This study was supported by Isfahan University of Medical Sciences, Isfahan, Iran. The financial support of this study was given by Food Security Research Center, Isfahan University of Medical Sciences, Isfahan, Iran. Pasquali R, Gambineri A. Polycystic ovary syndrome: A multifaceted disease from adolescence to adult age. Ann N Y Acad Sci 2006;1092:158-74. Thessaloniki ESHRE/ASRM-Sponsored PCOS Consensus Workshop Group. Consensus on infertility treatment related to polycystic ovary syndrome. Hum Reprod 2008;23:462-77. Wehr E, Möller R, Horejsi R, Giuliani A, Kopera D, Schweighofer N, et al. Subcutaneous adipose tissue topography and metabolic disturbances in polycystic ovary syndrome. Wien Klin Wochenschr 2009;121:262-9. Dunaif A. Insulin resistance and the polycystic ovary syndrome: Mechanism and implications for pathogenesis. Endocr Rev 1997;18:774-800. Goodarzi MO, Dumesic DA, Chazenbalk G, Azziz R. Polycystic ovary syndrome: Etiology, pathogenesis and diagnosis. Nat Rev Endocrinol 2011;7:219-31. Ehrmann DA, Sturis J, Byrne MM, Karrison T, Rosenfield RL, Polonsky KS. Insulin secretory defects in polycystic ovary syndrome. Relationship to insulin sensitivity and family history of non-insulin-dependent diabetes mellitus. J Clin Invest 1995;96:520-7. Cussons AJ, Stuckey BG, Watts GF. Cardiovascular disease in the polycystic ovary syndrome: New insights and perspectives. Atherosclerosis 2006;185:227-39. Boyle JA, Cunningham J, O'Dea K, Dunbar T, Norman RJ. Prevalence of polycystic ovary syndrome in a sample of Indigenous women in Darwin, Australia. Med J Aust 2012;196:62-6. March WA, Moore VM, Willson KJ, Phillips DI, Norman RJ, Davies MJ. The prevalence of polycystic ovary syndrome in a community sample assessed under contrasting diagnostic criteria. Hum Reprod 2010;25:544-51. Diamanti-Kandarakis E, Kouli CR, Bergiele AT, Filandra FA, Tsianateli TC, Spina GG, et al. A survey of the polycystic ovary syndrome in the Greek island of Lesbos: Hormonal and metabolic profile. J Clin Endocrinol Metab 1999;84:4006-11. Setji TL, Brown AJ. Polycystic ovary syndrome: Update on diagnosis and treatment. Am J Med 2014;127:912-9. Costello MF, Misso ML, Wong J, Hart R, Rombauts L, Melder A, et al. The treatment of infertility in polycystic ovary syndrome: A brief update. Aust N Z J Obstet Gynaecol 2012;52:400-3. Lindström J, Neumann A, Sheppard KE, Gilis-Januszewska A, Greaves CJ, Handke U, et al. Take action to prevent diabetes - The IMAGE toolkit for the prevention of type 2 diabetes in Europe. Horm Metab Res 2010;42 Suppl 1:S37-55. Yadav H, Jain S, Sinha PR. Antidiabetic effect of probiotic dahi containing Lactobacillus acidophilus and Lactobacillus casei in high fructose fed rats. Nutrition 2007;23:62-8. Alokail MS, Sabico S, Al-Saleh Y, Al-Daghri NM, Alkharfy KM, Vanhoutte PM, et al. Effects of probiotics in patients with diabetes mellitus type 2: Study protocol for a randomized, double-blind, placebo-controlled trial. Trials 2013;14:195. Allen SJ, Jordan S, Storey M, Thornton CA, Gravenor M, Garaiova I, et al. Dietary supplementation with lactobacilli and bifidobacteria is well tolerated and not associated with adverse events during late pregnancy and early infancy. J Nutr 2010;140:483-8. Tanriover MD, Aksoy DY, Unal S. Use of probiotics in various diseases: Evidence and promises. Pol Arch Med Wewn 2012;122 Suppl 1:72-7. Harisa GI, Taha EI, Khalil AF, Salem MM. Oral Administration of Lactobacillus acidophilus restores nitric oxide level in diabetic rats. Aust J Basic Appl Sci 2009;3:2963-9. Ma YY, Li L, Yu CH, Shen Z, Chen LH, Li YM. Effects of probiotics on nonalcoholic fatty liver disease: A meta-analysis. World J Gastroenterol 2013;19:6911-8. Musmar S, Afaneh A, Mo'alla H. Epidemiology of polycystic ovary syndrome: A cross sectional study of university students at An-Najah national university-Palestine. Reprod Biol Endocrinol 2013;11:47. Bargiota A, Diamanti-Kandarakis E. The effects of old, new and emerging medicines on metabolic aberrations in PCOS. Ther Adv Endocrinol Metab 2012;3:27-47. Diamant M, Blaak EE, de Vos WM. Do nutrient-gut-microbiota interactions play a role in human obesity, insulin resistance and type 2 diabetes? Obes Rev 2011;12:272-81. Caesar R, Fåk F, Bäckhed F. Effects of gut microbiota on obesity and atherosclerosis via modulation of inflammation and lipid metabolism. J Intern Med 2010;268:320-8. Cani PD, Delzenne NM. The gut microbiome as therapeutic target. Pharmacol Ther 2011;130:202-12. Delzenne NM, Cani PD. Nutritional modulation of gut microbiota in the context of obesity and insulin resistance: Potential interest of prebiotics. Int Dairy J 2010;20:277-80. Ley RE. Obesity and the human microbiome. Curr Opin Gastroenterol 2010;26:5-11. Tuohy KM, Gougoulias C, Shen Q, Walton G, Fava F, Ramnani P. Studying the human gut microbiota in the trans-omics era - Focus on metagenomics and metabonomics. Curr Pharm Des 2009;15:1415-27. Nitert MD, Barrett HL, Foxcroft K, Tremellen A, Wilkinson S, Lingwood B, et al. SPRING: An RCT study of probiotics in the prevention of gestational diabetes mellitus in overweight and obese women. BMC Pregnancy Childbirth 2013;13:50. Laitinen K, Poussa T, Isolauri E; Nutrition, Allergy, Mucosal Immunology and Intestinal Microbiota Group. Probiotics and dietary counselling contribute to glucose regulation during and after pregnancy: A randomised controlled trial. Br J Nutr 2009;101:1679-87. Asemi Z, Zare Z, Shakeri H, Sabihi SS, Esmaillzadeh A. Effect of multispecies probiotic supplements on metabolic profiles, hs-CRP, and oxidative stress in patients with type 2 diabetes. Ann Nutr Metab 2013;63:1-9. Asemi Z, Jazayeri S, Najafi M, Samimi M, Mofid V, Shidfar F, et al. 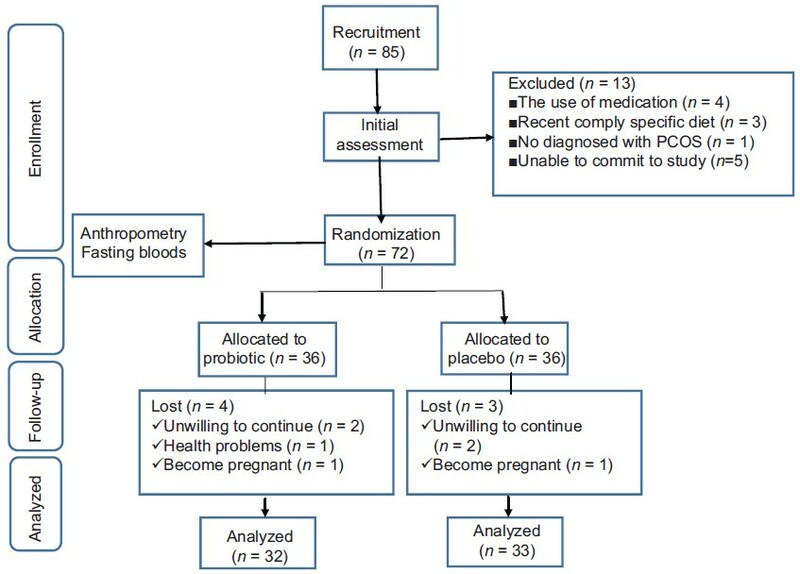 Effects of daily consumption of probiotic yoghurt on inflammatory factors in pregnant women: A randomized controlled trial. Pak J Biol Sci 2011;14:476-82. Zhang JW, Du P, Chen DW, Cui L, Ying CM. Effect of viable Bifidobacterium supplement on the immune status and inflammatory response in patients undergoing resection for colorectal cancer. Zhonghua Wei Chang Wai Ke Za Zhi 2010;13:40-3. Anderson AD, McNaught CE, Jain PK, MacFie J. Randomised clinical trial of synbiotic therapy in elective surgical patients. Gut 2004;53:241-5. Hatakka K, Martio J, Korpela M, Herranen M, Poussa T, Laasanen T, et al. Effects of probiotic therapy on the activity and activation of mild rheumatoid arthritis - A pilot study. Scand J Rheumatol 2003;32:211-5. Ranganathan N, Friedman EA, Tam P, Rao V, Ranganathan P, Dheer R. Probiotic dietary supplementation in patients with stage 3 and 4 chronic kidney disease: A 6-month pilot scale trial in Canada. Curr Med Res Opin 2009;25:1919-30. Lye HS, Kuan CY, Ewe JA, Fung WY, Liong MT. The improvement of hypertension by probiotics: Effects on cholesterol, diabetes, renin, and phytoestrogens. Int J Mol Sci 2009;10:3755-75. Sadrzadeh-Yeganeh H, Elmadfa I, Djazayery A, Jalali M, Heshmat R, Chamary M. The effects of probiotic and conventional yoghurt on lipid profile in women. Br J Nutr 2010;103:1778-83. Introduction of a Qualified Presumption of Safety [QPS] approach for assessment of selected microorganisms referred to EFSA. Opinion of the Scientific Committee. The EFSA J 2007;587:1-16.